The MET HOTEL is situated in the new harbour area of Thessaloniki only 1,8km away from Aristotelous square at the city centre. 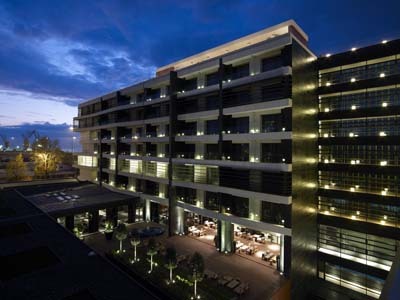 THE MET HOTEL, an exquisite combination of unique location, modern architecture, high-end luxury, launches an avant-garde hospitality concept in the city of Thessaloniki. 212 guest rooms and suites enjoying city and sea views, welcome guests to a sophisticated combination of high aesthetics and technology, discreet luxury and relaxation. Dinning at THE MET HOTEL in a stylish yet relaxed atmosphere, the guest discovers the flavours of international and contemporary Asian cuisine that blend gently into the vibes of the city’s nightlife. Thirteen state of the art, fully flexible, technologically advanced meeting rooms, are ready to host any event from 7 to 700 people. An escape to the serenity of the spa and the fully equipped fitness centre, or a revitalizing dive into the outdoor rooftop pool with 360° city and sea views, is an urban luxury that only THE MET HOTEL guests will enjoy.